This month has been the one with two important announcements from Google - affecting both Paid Search realm and Organic Search realm. The first one was removal of sidebar ad slots in Google SERPs; the second one was around Accelerated Mobile Pages and new search carousel dedicated to AMP pages. Today, we will touch base on an advanced topic in paid search which has become even more important due to the perceived reduction in as slot - Ad Extensions. 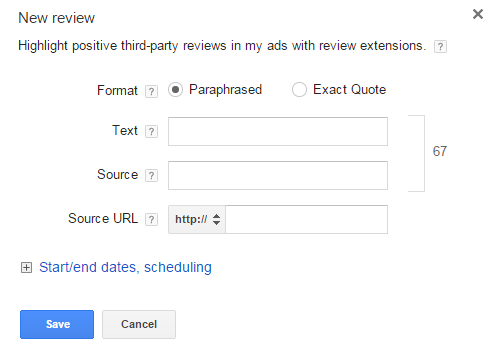 Ad extensions are available in both Google AdWords and Bing adCenter. However the options provided in AdWords is more compared to adCenter. 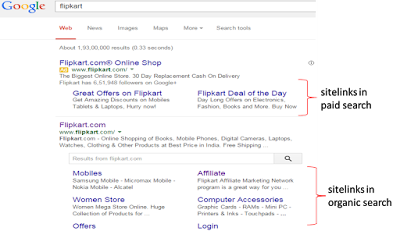 Ad extensions helps in improving the visibility of your ads and also the chance of searchers clicking them. As you may have guessed, ad extensions are providing additional information or improving the ads beyond the standard information you can provide for an ad in AdWords or adCenter. Some of these extensions are straightforward, some required you to have a decent technical acumen. Thus ad extensions could be considered to be of two types - manual and automated extensions. Some ad extensions can be controlled by the advertiser, while some are automated by Google. 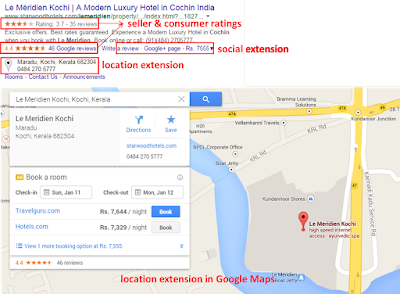 Manual extensions include sitelink extensions, location extensions, apps, reviews, call outs and call extensions. Automated extensions include seller ratings, consumer ratings, social extensions, and previous visits. Some of these extensions are at campaign level, while some can be controlled at ad group level. Let's try to briefly understand each of them. As you might have guessed, these allow your contact phone number to be included along with an option to call on the spot (like the skype call in functionality that it provides). If you are a business with an advertising goal of improving calls/enquiries, call extensions are one way to go. The benefit of this extension is that if the user is seeing the mobile ad, an automatic click to call feature is enabled. If the ad is shown in desktop, a 'Call Now' is enabled. This extension allows a map pin to be shown in the ad. Again, a relevant extension for local business and mobile ads. The real benefit of using location is extension is that the address shown in the ad is usually the geographically closest one to the searcher. We can set multiple business locations at campaign level and the ad will show the address and phone number for the location that is closest to the customer. Another usage of local extensions is to show the ad in Google Maps. In order for a business to use location extensions in AdWords, it need to have a Google My Business account set up; in the case of adCenter, it’s a direct wizard. Review extensions help you to embed a customer testimonial from a reputed third-party site to your ad. Thus this extension provide yet another opportunity to showcase your credibility for an associated search query. This extension allows to either embed the exact quote of paraphrased quote of the satisfied customer. Call out extensions help you to highlight you value propositions. In effect, this helps to increase ad content by another line. However its limited by 25 characters and whether it get shown or not depends on Google's editorial policies. We can use callouts along with other ad extensions like sitelinks. Also there is an option to add callouts at account, campaign or ad group. Similar to Call extensions, these allow a marketer to link ads with apps; thus providing a better chance of a searcher downloading the app. Thus an ad using app extension increases the probability of either visiting the company's website or downloading the app from Google Play/iTunes. This ad extension is very handy in the case of mobile apps since AdWords detect the mobile OS from which a user is seeing the ad and automatically points to the appropriate app URL. There are two types of ratings extensions - Consumer ratings and Seller ratings. Both of these are relatively new ad extensions added by Google. Consumer ratings provide a value for the website in a 1-10 relative rating scale. The rating is pulled from Google's Consumer Survey application. Google Consumer Survey product is Google's answer to doing online marketing research. Consumer ratings are available only in a selected set of countries. On the other hand seller ratings are pulled based on a collection of third-party review sites. We need not do any set-up specifically for seller ratings. The set of sources from where Google aggregates the rating is provided here. There are few other criteria like page views in order for your ad to start showing the seller ratings. Similar to the concept of re-marketing, this ad extension shows in the ad content whether, when and how many times you have previously visited the website for which the ad is shown. Social extension essentially shows a gist of your Google + follower-ship. Again, showing Google + details is guaranteed only if you have set-up the business profile, have a vibrant page and so on. In a way this is an expansion of sitelinks. 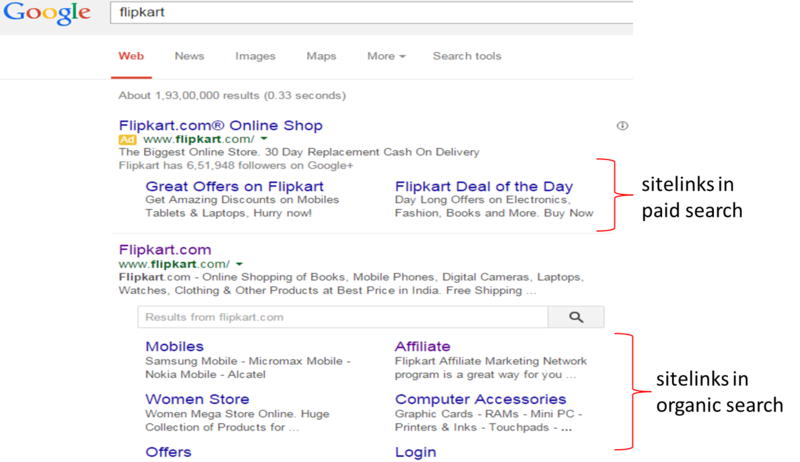 Based on the search query, AdWords try to map web pages on your site and show that in the ad content. Here the relationship that Google looks for is how relevant and popular are certain pages in the site with respect to the search query for which the ad is shown. We need not create additional links, AdWords directly picks up the links. The added benefit of this extensions is that you will not be charged if an user clicks on the dynamically generated sitelink in the ad! Are you utilizing ad extensions to improve your PPC ROI....?